This site tells you about cacti and other succulents. Well – all cacti are succulents – but not all succulents are cacti. All plants need water to grow. Succulents are any plants which are adapted to store water. This means that they often live in very dry places or places where there is only rainfall at long intervals. Cacti are stem succulents, that is they have fleshy stems where they store water. 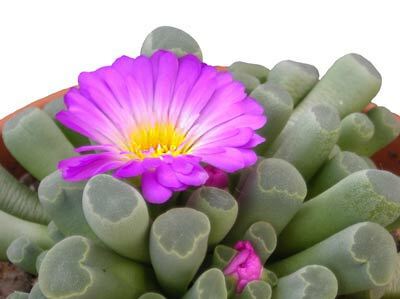 Other succulents might have fleshy leaves or sometimes large swollen roots. For help and advice on growing cacti you might like to join the BCSS forum. There are plenty of people on the forum who can answer all your questions. There are over 2,000 different types of cacti. Cacti can live for hundreds of years. The tallest cactus can grow to 20m. The smallest is only 12-16mm across. 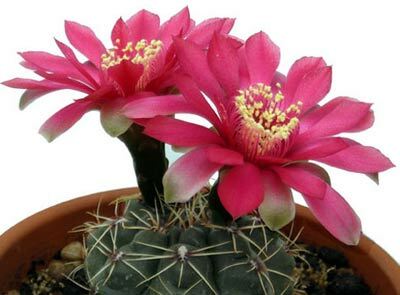 Cactus flowers can be red, orange, yellow, white, pink or magenta but never blue. The succulent agave can have a flower spike which is 12m tall. Aloe vera is a succulent plant which is used in many cosmetic products. Some succulents hide themselves by looking like the stones around them. Some succulents are known as window plants. In the wild they grow flat to the ground, and have windows in the tops of their leaves to let the light in. (See left).